When he made his debut with the hometown St. Louis Browns in August 1904, Art Bader was the major leagues’ youngest player at 17 years, 10 months, 315 days. At the conclusion of his big-league career, Bader was a day older. After his quick release by the Browns, Bader continued to play ball, toiling in the minors until 1910, when he abandoned the game to immerse himself in the civic affairs of St. Louis. For decades thereafter, Bader served the Mound City as a St. Louis city attorney, criminal court judge, and excise commissioner. But despite a distinguished record of public service, Art Bader lingers in memory for only one reason. For two games, he was a major-league ballplayer. Arthur Herman Bader was an only child, born in St. Louis on September 21, 1886.1 His father, St. Louis native Herman P. Bader, was also a professional baseball player. The year that his son was born, Herman Bader began a seven-year minor-league career as a fleet-footed but weak-hitting outfielder, playing for the Lincoln Tree Planters of the Western League. Three seasons later, Herman would be credited with a remarkable 146 stolen bases in only 90 games played for the Dallas Tigers of the Texas League. But that year he also batted a meager but typical .237. Herman gave the game up after the 1892 season, returning to St. Louis to open a saloon, and later a bowling alley. He also got involved in local Republican Party politics, his services later being rewarded by appointment as clerk of the St. Louis Court of Correction, a post he would hold for many years. All the while, his wife, the German-born Clara Thiele Bader, remained a homemaker. An athlete like his father, Art Bader starred on the football, basketball, and baseball teams at St. Louis Central High School. He was also an excellent student. While still a schoolboy, Art began playing summer baseball in the Trolley League, St. Louis’s highly competitive semipro circuit and a breeding ground for professional talent. In midsummer 1904, the St. Louis Browns, mired deep in the American League second division and seeking ways to sustain fan interest, signed local teenagers Bader and Pat Hynes.2 A right-handed batter and thrower, the 5-foot-10, 170 pound youngster had been equally adept as an infielder and outfielder playing on local sandlots. On August 2, 1904, Browns manager Jimmy McAleer penciled Bader into the starting lineup as his left fielder for a home game against the Philadelphia A’s. McAleer apparently had no intention of coddling the 17-year-old recruit. Bader’s major-league debut would come against Athletics flamethrower Rube Waddell, then in the midst of a [onetime] AL record 349-strikeout season. But Waddell was less than sharp that day, striking out only four Browns, while walking four and hitting three St. Louis batsmen. Still, he was good enough to emerge a 4-3 victor. Bader was one of the Waddell strikeout victims while going an official 0-for-2 at the plate. But he also drew a walk and handled his two chances in the outfield cleanly. The following afternoon, Bader appeared in his second and final major-league game as an unsuccessful ninth-inning pinch-hitter in a 10-4 loss to the A’s. Unbeknownst to the promising young player, his major-league career was now over. Having gone 0-for-3 with a walk at the plate, he departed the scene with a .000/.250/.000 lifetime major-league batting line. In September 1904 Art Bader, only recently graduated from high school, decided to forgo college and enroll directly in the prestigious Washington University (of St. Louis) Law School. For the next six years, he pursued his legal studies during the offseason while spending summers with various minor-league teams. At the conclusion of the spring 1905 law-school semester, Bader joined the Colorado Springs Millionaires of the Class A Western League, having been recommended to the club “by well-known authorities.”3 A month after Bader joined the club, the franchise was relocated to Pueblo, Colorado. In 92 games, mostly as a shortstop or second baseman, Art batted .247.4 He returned to Pueblo the following summer, drawing praise for excellent defensive work at second5 and batting a solid .305 in 104 games for the last-place (63-85) Indians. Still only 19 years old, Art began the 1907 season back in the St. Louis Trolley League before rejoining Pueblo in mid-July.6 Proving his previous season’s work was no fluke, Bader tore up Western League pitching, posting a .346 BA in 62 games. In 1909 Bader bypassed his spring semester law school classes to report to the White Sox camp in San Luis Obispo, California. He was plagued by a charley horse in the early going, and most of his spring action came with the club’s yannigans. On occasion, Art showed promise, as witnessed by the two doubles and a home run that he hit in an April 10 exhibition game against the Western League Omaha Rourkes. But in the end Bader proved unable to land a White Sox berth and was optioned back to Des Moines. Disappointed, Art at first refused to report to the Boosters and briefly landed on the suspended list.10 Soon, however, he was back in a Des Moines uniform and playing the only full season of his professional career (138 games). Bader hit a productive .293, with five homers among his 26 extra-base hits, and formed an integral component of the Boosters’ worst-to-first 1909 campaign. Paced by the yeoman work of future White Sox pitchers Frank Lange (29-12) and Frank Miller (24-16), Des Moines (93-59) captured the Western League pennant by an .003 eyelash over the runner-up Sioux City Soos (94-60). Despite a fine season and his youth (still only 23 years old), Bader went undrafted at the close of the 1909 season. Evidently he was no longer considered a major-league prospect. With the permission of Des Moines team owner John F. Higgins, Bader remained in St. Louis the following spring, completing the course requirements for his law degree while 1910 training camp was conducted. Bader did not report to Des Moines until June 1.11 When he arrived, Bader found the club in disarray. Without suitable mound replacements for the now-departed Lange and Miller, preseason favorite Des Moines was floundering in the second division. Rushed into the starting lineup with virtually no preparation, Bader proved of little help. He started the season 2-for-22 at the plate, and seemed to have lost both his talent and enthusiasm for playing baseball. It was also speculated that Bader had not fully recovered from a serious beaning suffered during the 1909 season. As the situation deteriorated, a non-bylined local sportswriter observed that “the outfielder, who last year and the year before was one of the cleverest gardeners in the league and one of the most consistent hitters, has fallen off in his work badly in both departments.”12 After 70 games and with his batting average standing at a dismal .204, Art Bader was unconditionally released by Des Moines. His professional baseball playing career had come to its end. Having been admitted to the Missouri bar upon law school graduation, Bader returned home to St. Louis, where he opened a law office. Following his father’s lead, Art also began to dabble in the affairs of the St. Louis Republican Party. In time his political activities landed Bader a position as an assistant city attorney. He also actively participated in the affairs of Delta Chi, his fraternity while attending Washington University Law School. Although his diamond career had ended at a premature age, Bader had not completely lost interest in baseball. In 1913, he took a modest financial stake in the St. Louis Terriers, the local entry in a newly formed minor league circuit called the Federal League.13 When the Federal League declared itself a major league the following year, Bader assumed a full-time position in the Terriers front office, where he “kept close tab on expenses during spring training” as club secretary.14 Art also took on increased responsibilities on the domestic front. On August 21, 1915, the 28-year-old Bader married Hazel Vernice Emberson of LaCrosse, Wisconsin. Thereafter, the birth of daughters Lois (1916) and Jeanne (1926) completed the family. Bader continued working as city excise commissioner until his health began to fail in early 1957. Afflicted with heart disease, he took a several-month leave of absence. On April 5, 1957, Art Bader suffered a heart attack and died at St. Louis Baptist Hospital. He was 70 years old, and was survived by his aged mother, Clara; his wife, Hazel; and daughters Lois Bader Tuttle and Jeanne. Following funeral services, Arthur Herman Bader was interred at Valhalla Cemetery in St. Louis. 1 Sources for the biographical detail of this profile include the Art Bader file and questionnaire maintained at the Giamatti Research Center, National Baseball Hall of Fame and Museum, Cooperstown, New York; US Census data; and various of the newspaper articles cited herein, particularly the Bader obituaries published in the St. Louis Post-Dispatch and St. Louis Globe-Democrat, April 6, 1957. 2 Sporting Life, September 3, 1904. Bader’s new Browns teammate, the 19-year-old Hynes, had played a September 1903 game for the St. Louis Cardinals. 3 Sporting Life, June 17, 1905. 4 Statistics provided herein are taken from http://www.baseball-reference.com. 5 Sporting Life, August 25, 1906. 6 Sporting Life, July 13, 1907. 7 Sporting Life, August 25, 1908. 8 Chicago Tribune, July 16, 1908. 9 Sporting Life, August 22 and September 5, 1908. 10 Sporting Life, May 15, 1909. 11 Des Moines Daily Capital and Des Moines Evening Tribune, March 24, 1910. 12 Des Moines Register and Leader, August 11, 1910. 13 Sporting Life, July 19, 1913. 14 Sporting Life, April 25, 1914. Later issues of the paper described Bader as the club’s business manager, while an informative history of the Federal League lists Bader’s position as St. Louis Terriers vice president. 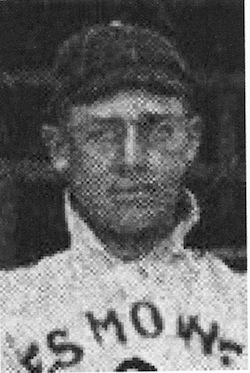 See Mark Okkonen, The Federal League of 1914-1915: Baseball’s Third Major League (Cleveland: SABR, 1989), 47. 15 See Cochran v. Wilson, 287 Mo. 210, 229 S.W. 1050 (1921). 16 As noted in the Bader obituaries published in the St. Louis Post-Dispatch and St. Louis Globe-Democrat, April 6, 1957. 17 Bader obituaries, Note 10. 18 As noted in a gaming-industry trade paper called The Billboard, April 8, 1944.